Pelagic zone is the part of the open sea or ocean that is not near the coast or sea floor. While the demersal zone comprises the water that is near to (and is significantly affected by) the coast or the sea floor. The name Pelagic is derived from the Greek πέλαγος (pélagos), which might be roughly translated as "sea" but is more accurately translated as "open sea." 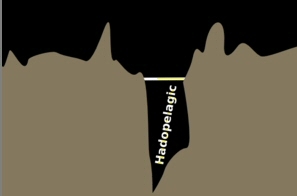 The Pelagic Zone are divided into about five main zones. From my observation I notice that most species of Kosher fish are found in the Epipelagic zone, the fish that live in the light. These fishes of light feeds on Planktons can grow into large fish which have high value nutrients. While the fishes of darkness are usually have monstrous looking, some are blind and colourless, they feed on food drop down to their zone or go up the upper zone in the dark to feed or prey unsuspected fishes. The bathypelagic, abyssopelagic, and hadopelagic zones are very similar in character, sea creature living in those zones are unclean, tamei, unkosher not fit for human consumption.